Stayed here in January, and was very much looking forward to it. Unfortunately, we left highly disappointed & vowing to never return. For the price, this hotel service falls short. The guy at the door stands there and watches, as you struggle with bags, stroller etc as you get out of a taxi. And while I wanted to like the bar area, it was just too dark and not overly inviting. Was nice that hotel guests could always get a table however. The area had some great restaurants (Rosie's, a highlight) and was great to explore on foot. However, for me, I will be definitely staying elsewhere when I return to NYC. Did not leave with a great impression of the Bowery Hotel. We were thrilled to be invited to a NYC wedding at this great hotel. The bride and groom made all the arrangements and everything was absolutely first class! Our room was a suite with views of the NYC skyline in particular the Empire State Building. A bonus was St. Patrick’s Day with the spire illuminated emerald green for the occasion. Front desk and doormen were delightful, knowledgeable and very attentive. Not to be outdone was Rico who took care of us on our frequent visits to the charming lobby bar which had a nice fire going to keep things cosy. The wedding itself was very special in a sunny, cheerful setting. The reception and dinner was elegant with exceptional service and amazing food. The beef tenderloin was the best I have ever had.To top it all off was a party with an orchestra . Our only disappointment was the Gemma restaurant where both food and service was underwhelming. All in a a great place where will stay on our next visit. When we checked in with the lovely front desk staff, they made sure we had the best room available. They took the time to listen to our requests and even bought us a round while we waited for our room to be available. After we checked in, they sent us a bucket of ice (without asking) then a bottle of wine. The room service is delish and prompt, and the hotel itself is very clean and has a great vibe throughout. We will definitely be staying here again in the future!!! My experience was 100% wonderful! All of the staff members (seriously, every single person whether a doorman, receptionist, server, housekeeping, or room service member) were delightful to interact with. I've been to a number of hotels in the area for work, and even with those high NYC prices, unfortunately I always found reasons to be less than satisfied or uncomfortable in some way. This was NOT the case with The Bowery! Someone who is incredibly thoughtful, empathetic, and spatially gifted must have designed the rooms. I loved every detail from the relative spaciousness compared to other similar-class hotels, the surface space around the bathroom vanity (yes, I have stayed at 4-star hotels in NYC where there is hardly anywhere to put my normal-sized toiletry bag - ugh! ), the robes and towel hooks, and the luxurious showers. The room was very warm (for the winter), but not stuffy, smelly, or noisy. I was truly impressed by every component of my stay and I would definitely return as well as recommend this hotel to anyone who wants a high-service, boutique experience at a top-aesthetic hotel. I have stayed in The Bowery several times and love the warm welcome and wonderful staff. But, on this trip I brought by mother (who is in her late 70's) with me to do some sight seeing as I worked during the day. Her impression of the hotel says all you need to know about this hotel. She LOVED it! Dinner by the fire was her favourite thing to do at the end of each long day.The staff were incredibly kind and helpful to her and made her feel like this was her home in New York. The Bowery thoughtfully cultivates an inclusive and welcoming atmosphere which takes this 5 star hotel to another level in my view. The food in Gemma was also really delicious for breakfast and dinner. 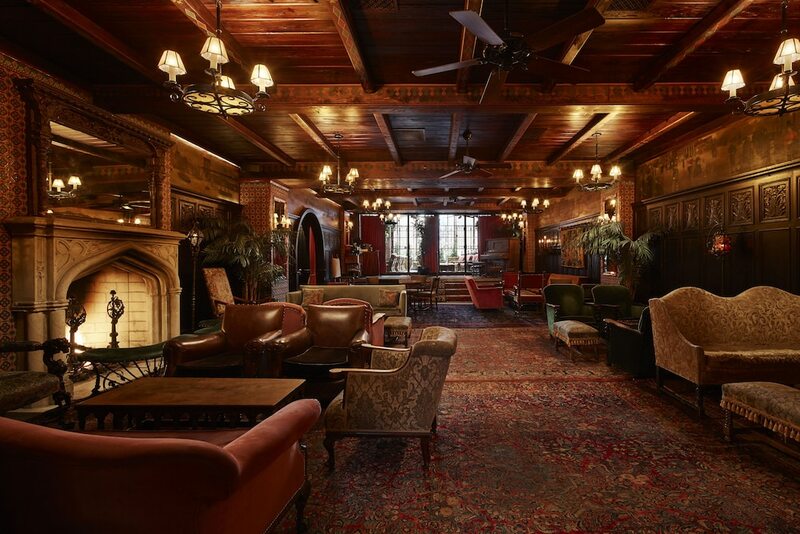 If you only visit New York City once in your life, make sure you stay at the Bowery Hotel! I have lived in New York City for almost 20 years and traveled extensively throughout the US, Europe and Asia. I’ve seen my fair share of fabulous hotels. My favorite place in my home city is The Bowery Hotel. It maintains a balance of the downtown New York City made famous by Lower Eastside legends like CBGB’s and B Bar, it’s history as the oldest and notorious street in the city, and it’s vibrancy as the fashionable corridor between the East Village and NoHo. There is no place like it. If you are lucky enough to stay in one of their gorgeous sun-filled rooms designed to feel like you are in your own New York City apartment, you’ll enjoy understated luxury amenities and “I’m never getting out of bed again” sheets. Really, you never need to leave. But, If you do decided to grab your key, on it’s red tassel key chain (no key cards here, folks!) and venture out, you don’t have to go far. In the lobby, you’ll have comfortable access to the living room where you can cozy up next to the fireplace in winter or sit outside during the warm summer evenings. You will never find riff-raff or rowdy party people. It’s an elegantly maintained balance of locals and like-minded global community. The staff treat you like you are a long standing resident; warm, thoughtful and ready to make every moment you’re with them the best it can be. My recent stay was particularly fantastic made in part by the incredibly gracious front staff, the always superb Gemma kitchen and the most amazing Leo Jacobs who never fails to make sure every detail is perfect and each experience is better than the last. What a lovely hotel!!! Couldn't have asked for a better stay! Staff were very attentive. We ate breakfast and dinner at the hotel and both were quite yummy. I would definitely recommend this location!! Look forward to returning! Located in East Village, The Bowery Hotel is within a 10-minute walk of popular sights such as New York University and 5th Avenue. This 4-star hotel has 135 rooms and welcomes guests with a restaurant, free in-room WiFi, and a fitness center. In addition to a restaurant that serves breakfast, brunch, lunch, and dinner, there's also a lobby lounge. Savor a meal from the privacy of your room with 24-hour room service, or get a pick-me-up at the coffee shop/café. Guests can expect to find free WiFi and a flat-screen TV with pay movies. Beds sport Egyptian cotton sheets and the bathroom offers a rainfall showerhead, a hair dryer, and designer toiletries. Other standard amenities include an iPod dock, a minibar, and free newspapers. At The Bowery Hotel, guests have access to a fitness center, free WiFi in public areas, and conference space. Valet parking is offered for USD 55 per day. Multilingual staff at the 24-hour front desk can assist with securing valuables, concierge services, and dry cleaning/laundry. Additional amenities include free newspapers and a fireplace in the lobby. Gemma Restaurant - Restaurant open daily for breakfast, brunch, lunch, and dinner. Lobby Bar and Lounge - Lobby lounge. Recreation features at The Bowery Hotel include a fitness center.